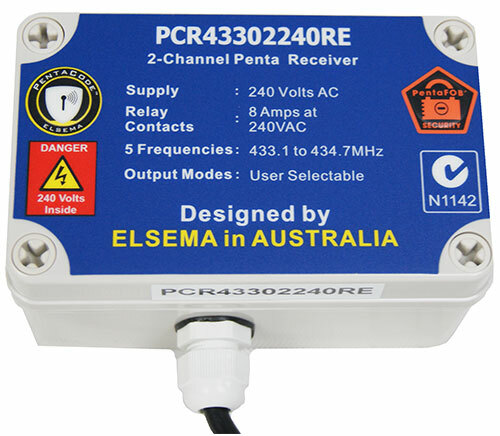 This receiver is compatible with PentaFOB and PentaCODE remotes. It is powered directly from the mains supply. 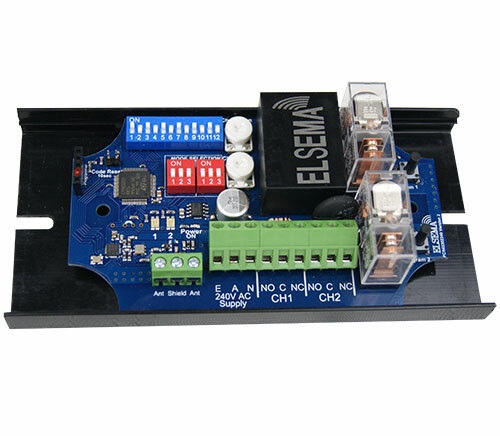 It has two relay outputs which can be switched “on” and “off ” independently. The relays are capable of switching loads of up to 16 Amps at 240Volts AC. Applications include light control, security shutters or anywhere else you need a wireless signal to transmit a contact closure. With the 12-way dip switch, just match the keyring remotes and the receiver’s dip switch and it’s coded. With the encrypted code you switch all the 12-way dip switches OFF and the remote and receiver automatically goes into the encrypted coding. Please see coding instructions for encrypted coding procedure. 12-way dip switch coding or one of over 17 billion encrypted codes.